This three-hour lesson describes the impacts of weather on aviation operations and highlights the role of the National Weather Service (NWS) in supporting the Federal Aviation Administration's air traffic management organization. The lesson contains an Introduction (40 min), several cases (10-20 min each) focused on various weather phenomena, and a detailed case (35 min) allowing forecasters to follow the planning for and evolution of an event. The content emphasizes best practices for aviation forecasters, including identifying and communicating the threat, understanding partners' needs, and anticipating the impacts to airspace operations. this is on the job training. A good course for analytical purposes! Questions did not really reflect the lesson material. Needs more emphasis and explanation of the different programs and how they interact with each other. Overall, this was a good training lesson. I believe more illustrative animations and audio elements would help auditory and visual learners. 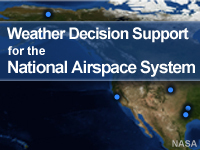 I am not a meteorologist, but I needed to know more about weather decision support for the national airspace weather system. I did have a familiarity with some of the aviation terminology which may have helped as I took the module. I would recommend this module to others like me. I was amazed at the number, and variations, of abbreviations used. Does the average United States forecaster really understand them all? Your humble UK forecaster certainly did not which made not only understanding of the lesson but also answering the quiz difficult. A constantly available Glossary would be very helpful. Commander (ex-UK and NATO Navy) David Dacam PhD.